About 21,000 people die every day of hunger or hunger-related causes, according to the United Nations. This is one person every four seconds. Sadly, it is children who die most often. Yet there is plenty of food in the world for everyone. The problem is that hungry people are trapped in severe poverty. They lack the money to buy enough food to feed their families. Being constantly malnourished, they become weaker and often sick. This makes them increasingly less able to work, which then makes them even poorer and hungrier. This downward spiral often continues until death for them and their families. 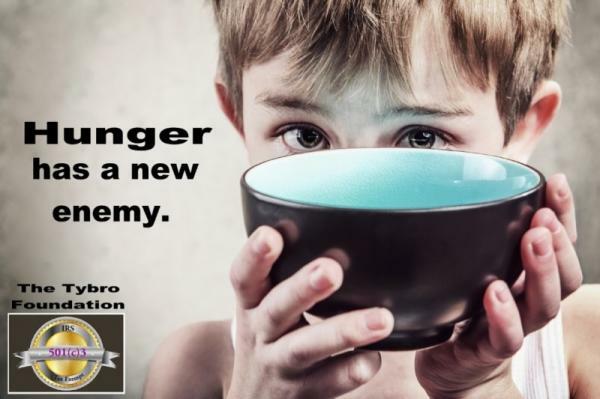 The Tybro Foundation, (a 501c3 corporation), is dedicated to helping in the fight to end world hunger in our lifetime. More than 80% of the funds that we receive go directly to food banks, needy families, and food giveaways that address hunger. We recently completed an event at Popeye’s in Greensboro in which we fed more than 2000 individuals. Our goal is to raise enough money so that we can offer backpacks and food for children starting school this fall. A poor child not only suffers from hunger, but they are most likely not going to have adequate supplies for school. Inadequate school supplies make learning difficult. In this way, the cycles of poverty, poor education, and hunger are linked. Our goal for our fall fundraiser is $10,000. As a 501c3 corporation, all donations that we receive are tax deductible. Please donate what you can today to help us end the cycle of hunger and poverty in our lifetime.